What are the effects of Pasilla (PS) gene depletion on splicing events? How to analyze RNA sequencing data using a reference genome? In the study of Brooks et al. 2011, the authors wanted to identify exons regulated by the Pasilla gene (the Drosophila homologue of the mammalian splicing regulators Nova-1 and Nova-2 proteins) using RNA sequencing data. They depleted the Pasilla (PS) gene in Drosophila melanogaster by RNA interference (RNAi). Total RNA was then isolated and used to prepare both single-end and paired-end RNA-seq libraries for treated (PS depleted) and untreated samples. These libraries were sequenced to obtain RNA-seq reads for each sample. The RNA-seq data for the treated and the untreated samples can be then compared to identify the effects of Pasilla gene depletion on splicing events. In this tutorial, we will reproduce the analysis of the RNA-Seq data step by step. The original data is available at NCBI Gene Expression Omnibus (GEO) under accession number GSE18508. Each sample constitutes a separate biological replicate of the corresponding condition (treated or untreated). Moreover, two of the treated and two of the untreated samples are from a paired-end sequencing assay, while the remaining samples are from a single-end sequencing experiment. 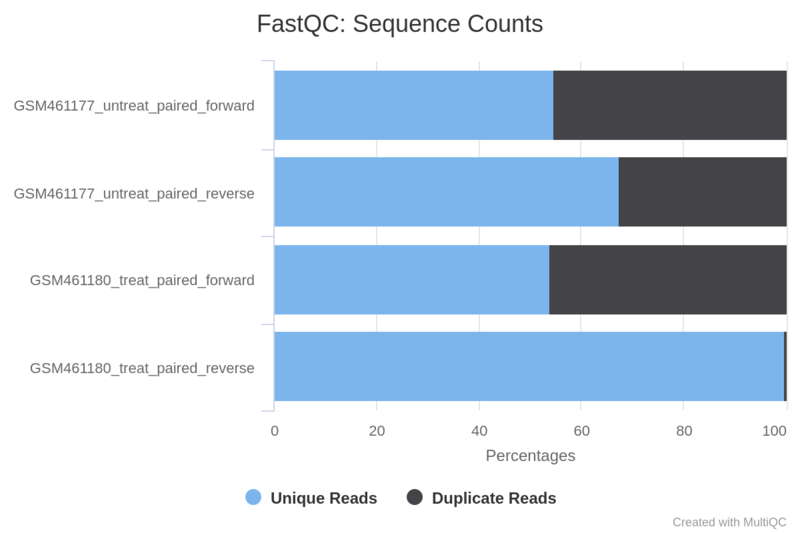 The raw RNA-seq reads have been extracted from the Sequence Read Archive (SRA) files and converted into FASTQ files. In the first part of this tutorial we will use the files for 2 of the 7 samples, to demonstrate analysis of FASTQs. Optionally later you can import the FASTQs for the other 5 samples. Note that these are the full files for the samples and ~1.5Gb each so it may take some minutes to import. Check that the datatype is fastqsanger (e.g. not fastq). If it is not, please change the datatype to fastqsanger. The reads are raw data from the sequencing machine without any pretreatments. They need to be assessed for their quality. Sequence quality control is therefore an essential first step in your analysis. 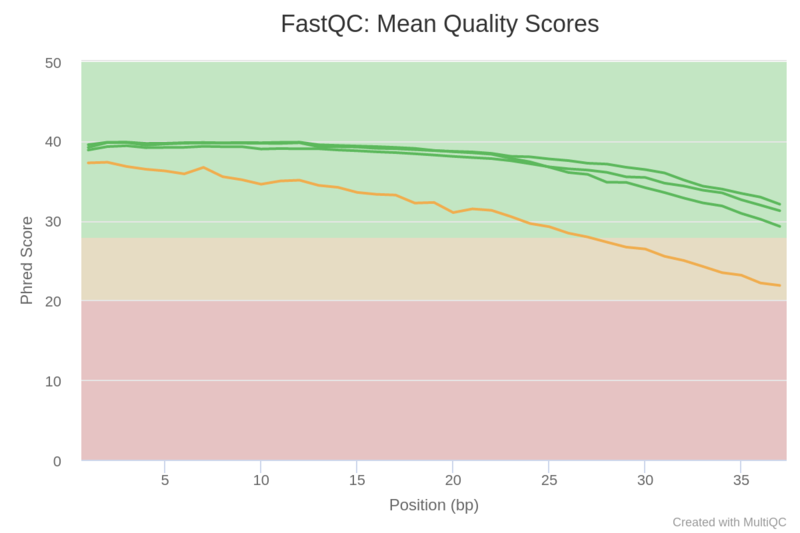 We will use similar tools as described in the “Quality control” training: FastQC and Cutadapt. The read length is 37 bp. What do you think of the quality of the sequences? 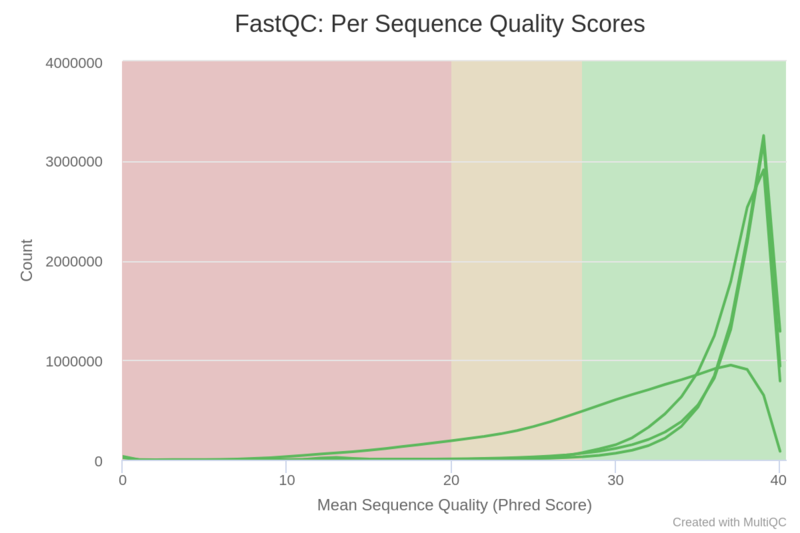 The “Per base sequence quality” is globally good with a slight decrease at the end of the sequences. For GSM461180_2, the decrease is quite large. 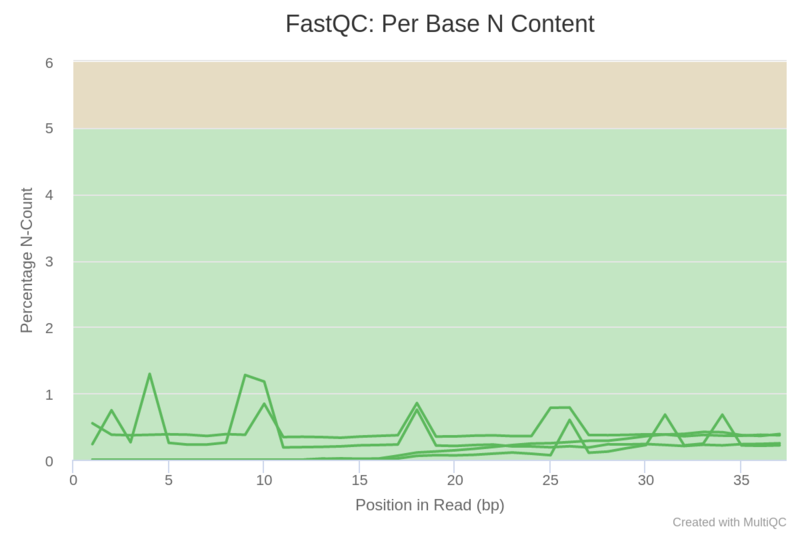 We should trim sequenced read to get rid of bases that were sequenced with high uncertainty (= low quality bases) at the read ends but also remove the reads of overall bad quality. What is the relation between GSM461177_1 and GSM461177_2 ? Here GSM461177_1 corresponds to the forward reads and GSM461177_2 to the reverse reads. Why do we run the trimming tool only once on a paired-end dataset and not twice, once for each dataset? The tool can remove sequences if they become too short during the trimming process. For paired-end files it removes entire sequence pairs if one (or both) of the two reads became shorter than the set length cutoff. Reads of a read-pair that are longer than a given threshold but for which the partner read has become too short can optionally be written out to single-end files. This ensures that the information of a read pair is not lost entirely if only one read is of good quality. How many basepairs has been removed from the forwards reads because of bad quality? And from the reverse reads? For GSM461177, 5,072,810 bp has been trimmed for the forward reads (read 1) and 8,648,619 bp on the reverse (read 2) because of quality. For GSM461180, 10,224,537 bp on forward and 51,746,850 bp on the reverse. It is not a surprise: we saw that at the end of the sequences the quality was dropping more for the reverse reads than for the forward reads, specially for GSM461180_2. 147,810 (1.4%) reads were too short for GSM461177 and 1,101,875 (9%) for GSM461180. To make sense of the reads, we need to first figure out where the sequenced DNA fragments originated from in the genome, so we can then determine to which genes they belong. This process is known as aligning or ‘mapping’ the reads to a reference. This is equivalent to solving a jigsaw puzzle, but unfortunately, not all pieces are unique. Do you want to learn more about the principles behind mapping? Follow our training. As a reference genome for Drosophila melanogaster is available, we can map the sequences to this genome in order to identify which genes are affected by the Pasilla gene depletion. 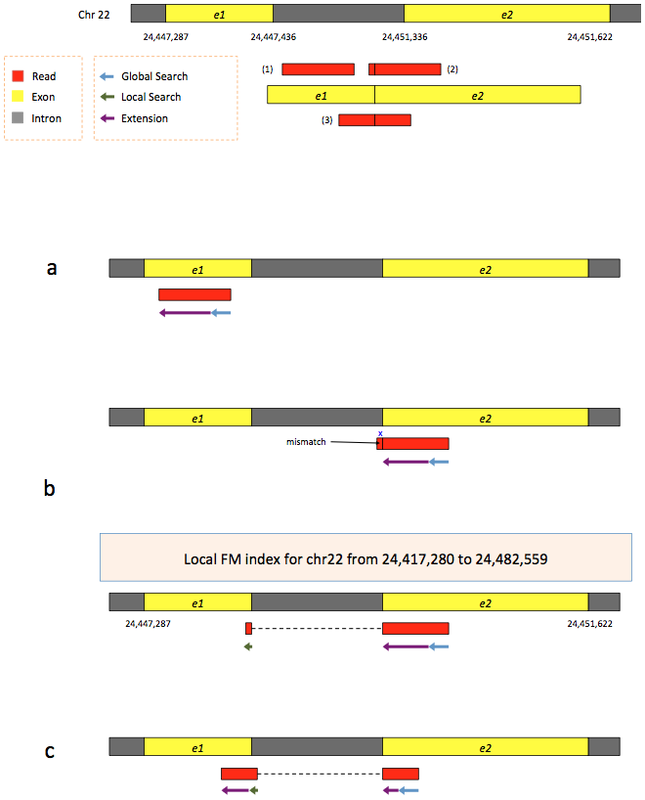 The genome of Drosophila melanogaster is known and assembled and it can be used as the reference genome in this analysis. Note that new versions of reference genomes may be released if the assembly improves, for this tutorial we are going to use the Release 6 of the Drosophila melanogaster reference genome assembly (dm6). 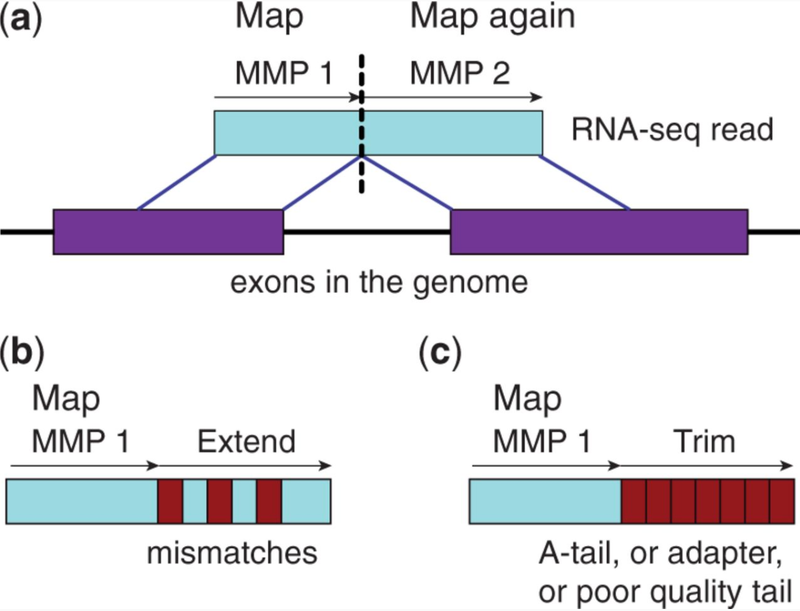 Several spliced mappers have been developed over the year with the explosion of RNA-seq data. TopHat (Trapnell et al, Bioinformatics, 2009) was one of the first tools designed specifically to address this problem. In TopHat reads are mapped against the genome and are separated into two categories: (1) those that map, and (2) those that initially unmapped (IUM). 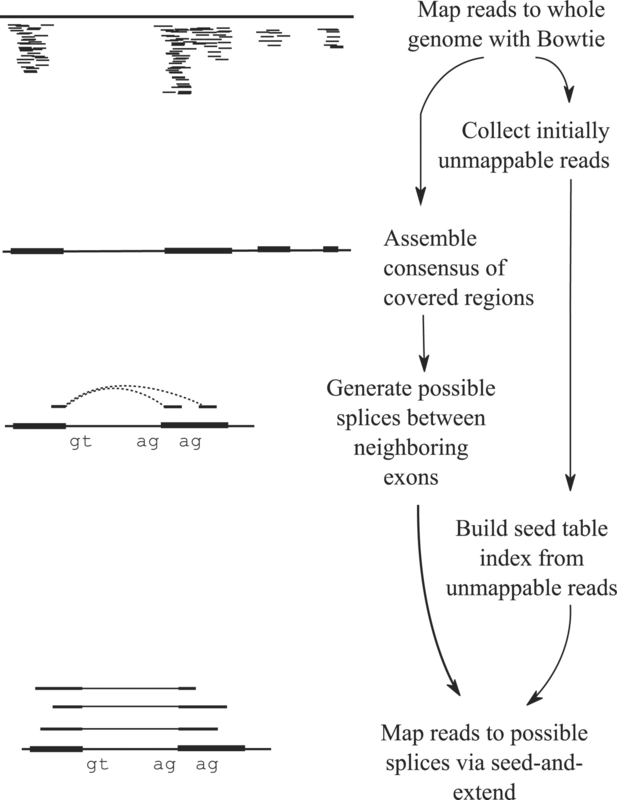 “Piles” of reads representing potential exons are extended in search of potential donor/acceptor splice sites and potential splice junctions are reconstructed. IUMs are then mapped to these junctions. 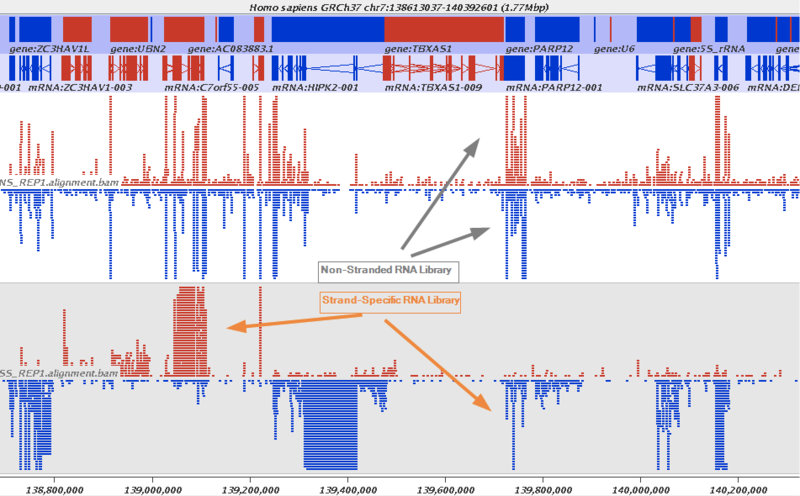 A part of the read (blue arrow) is first mapped to the genome using the global FM index. 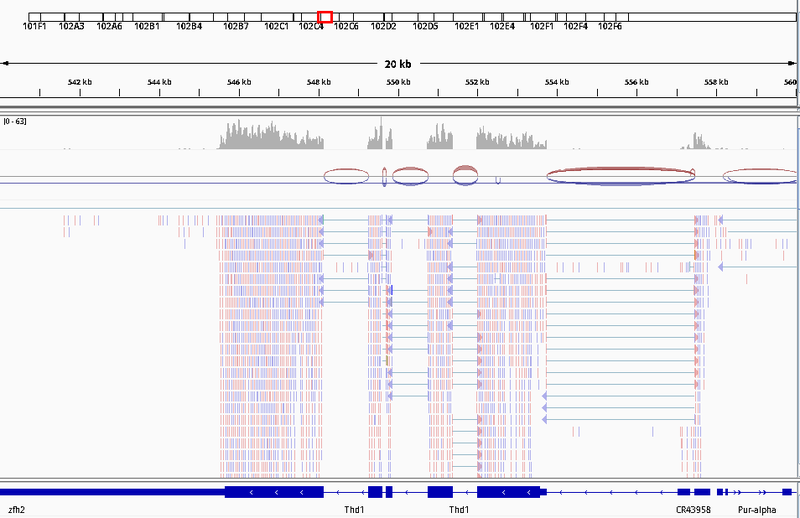 HISAT then tries to extend the alignment directly utilizing the genome sequence (violet arrow). In (a) it succeeds and this read is aligned as it completely resides within an exon. In (b) the extension hits a mismatch. Now HISAT takes advantage of the local FM index overlapping this location to find the appropriate mapping for the remainder of this read (green arrow). The (c) shows a combination these two strategies: the beginning of the read is mapped using global FM index (blue arrow), extended until it reaches the end of the exon (violet arrow), mapped using local FM index (green arrow) and extended again (violet arrow). We will map our RNA reads to the Drosophila melanogaster genome using STAR. What percentage of reads mapped exactly once for both samples? What are the other available statistics? We also have access to the number and percentage of reads that are mapped at several location, mapped at too many different location, not mapped because too short. 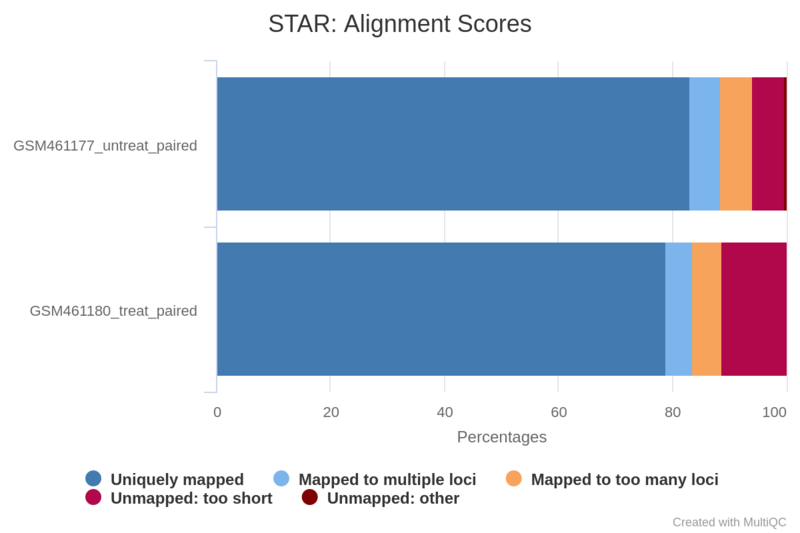 We could have been probably more strict in the minimal read length to avoid these unmapped reads because of length. STAR generates a BAM file with the mapped reads. What does such a file contain? 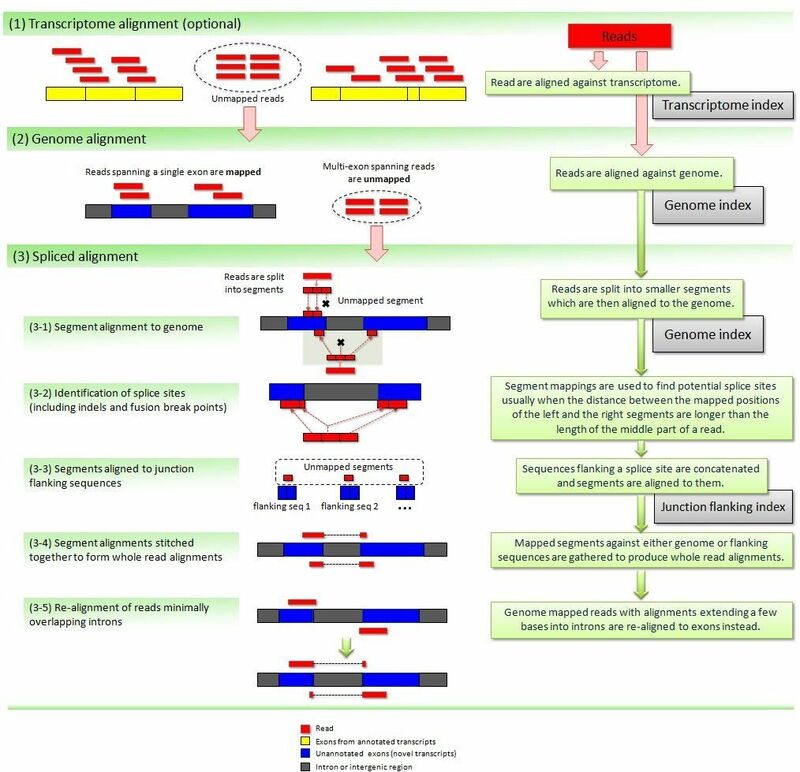 A Binary Alignment Map (BAM) file is the compressed version of a Sequence Alignment Map (SAM) file. A SAM file is a tab-delimited text file that contains sequence alignment data. The BAM file contains information about where the reads are mapped on the reference genome. But as it is a binary file containing information for many reads (several million for these samples), it is difficult to inspect and explore the file. A powerful tool to visualize the content of BAM files is the Integrative Genomics Viewer (IGV). In order for this step to work, you will need to have either IGV or Java web start installed on your machine. However, the questions in this section can also be answered by inspecting the IGV screenshots below. Check the IGV documentation for more information. What information appears at the top as grey peaks? What do the connecting lines between some of the aligned reads indicate? What does the vertical red bar graph represent? And the arcs with numbers? What do the numbers on the arcs mean? Why do we observe different stacked groups of blue linked boxes at the bottom? The numbers refer to the number of observed junction reads. 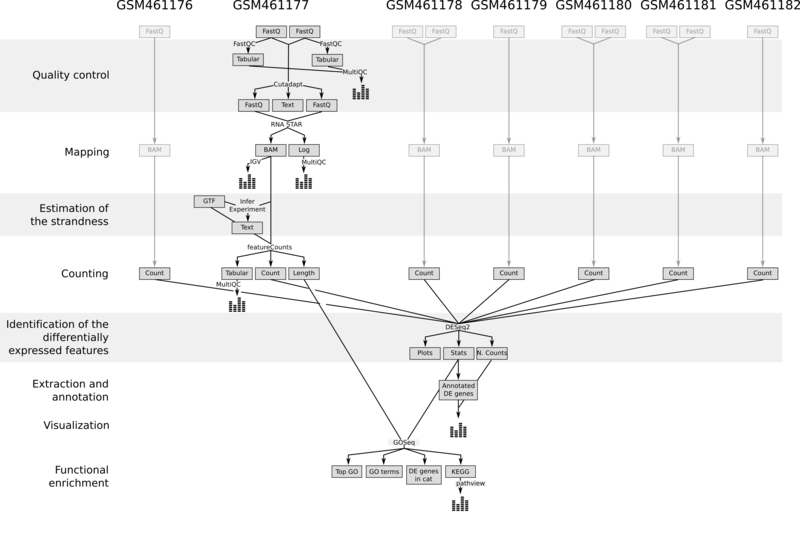 The different groups of linked boxes on the bottom represent the different transcripts from the genes at this location, that are present in the GTF file. After the mapping, we have the information on where the reads are located on the reference genome. We also know how well they were mapped. The next step in RNA-Seq data analysis is quantification of the number of reads mapped to genomic features (genes, transcripts, exons, …). The quantification depends on both the reference genome (the FASTA file) and its associated annotations (the GTF file). It is extremely important to use an annotation file that corresponds to the same version of the reference genome you used for the mapping (e.g. dm6 here), as the chromosomal coordinates of genes are usually different amongst different reference genome versions. In order to identify exons that are regulated by the Pasilla gene, we need to identify genes and exons which are differentially expressed between samples with PS gene depletion (treated) and control (untreated) samples. We will then analyze the differential gene expression and also the differential exon usage. We will first investigate the differential gene expression to identify which genes are impacted by the Pasilla gene depletion. To compare the expression of single genes between different conditions (e.g. with or without PS depletion), an essential first step is to quantify the number of reads per gene. How many reads are found for the different exons? How many reads are found for the different genes? Two main tools could be used for that: HTSeq-count (Anders et al, Bioinformatics, 2015) or featureCounts (Liao et al, Bioinformatics, 2014). FeatureCounts is considerably faster and requires far less computational resources, so we will use it here. In principle, the counting of reads overlapping with genomic features is a fairly simple task. But there are some details that need to be given to featureCounts: for example the strandness. 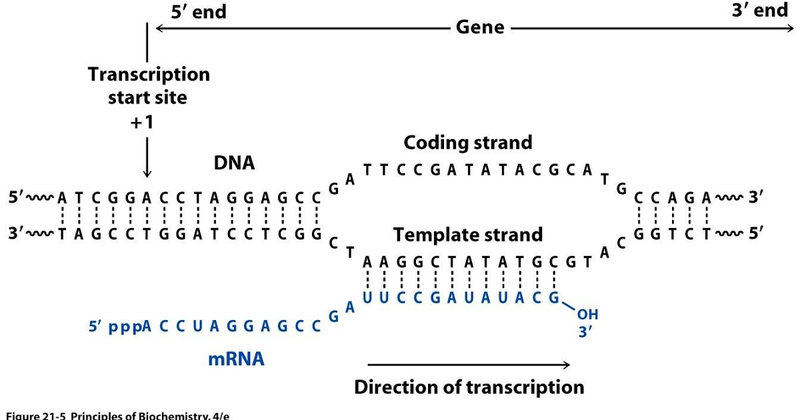 During a typical RNA-seq experiment the information about strandedness is lost after both strands of cDNA are synthesized, size selected, and converted into a sequencing library. However, this information can be quite useful for the read counting. 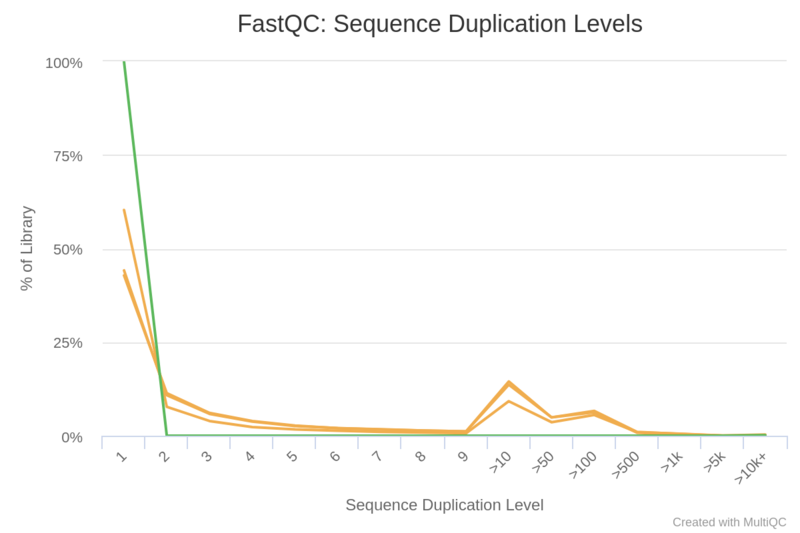 This information should be provided with your FASTQ files, ask your sequencing facility! If not, try to find it on the site where you downloaded the data or in the corresponding publication. Another option is to estimate these parameters with a tool called Infer Experiment from the RSeQC tool suite. This tool takes the output of your mappings (BAM files), selects a subsample of your reads and compares their genome coordinates and strands with those of the reference gene model (from an annotation file). Based on the strand of the genes, it can gauge whether sequencing is strand-specific, and if so, how reads are stranded. If the two “Fraction of reads explained by” numbers are close to each other, we conclude that the library is not a strand-specific dataset (U in previous figure). What are the “Fraction of the reads explained by” results for GSM461177? Do you think the library type of the 2 samples is stranded or unstranded? so 46.46% of the reads are SF and 43.88% SR. Similar statistics are found for GSM461180, so the library seems to be of the type unstranded for both samples. We now run featureCounts to count the number of reads per annotated gene. How many reads have been assigned to a gene? When should we be worried about the assignment rate? What should we do? Around 70% of the reads have been assigned to genes: this quantity is good enough. Some reads are not assigned because multi-mapped and other assigned to no features or ambiguous ones. 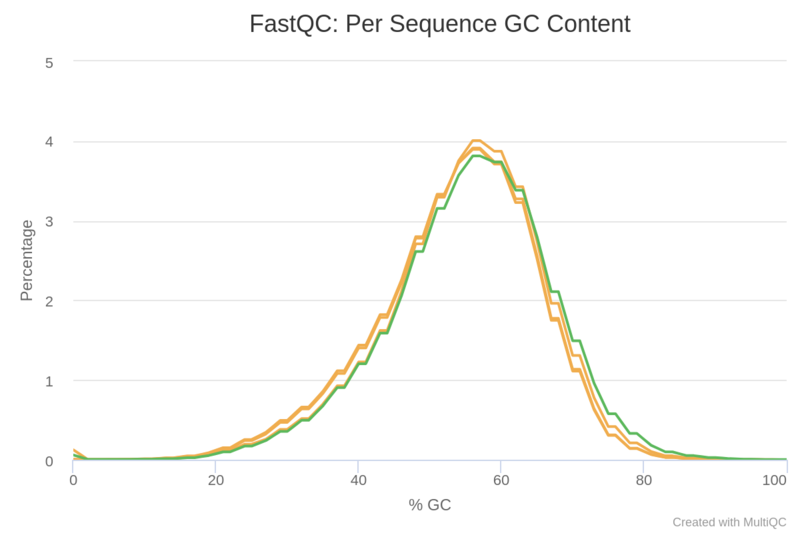 If the percentage is below 50%, you should investigate where your reads are mapping (inside genes or not, with IGV) and check that the annotation corresponds to the correct reference genome version. The feature length output datasets generated by featureCounts will be needed later on when we will run the goseq tool. The main output of featureCounts is a table. What information does the generated table contain? 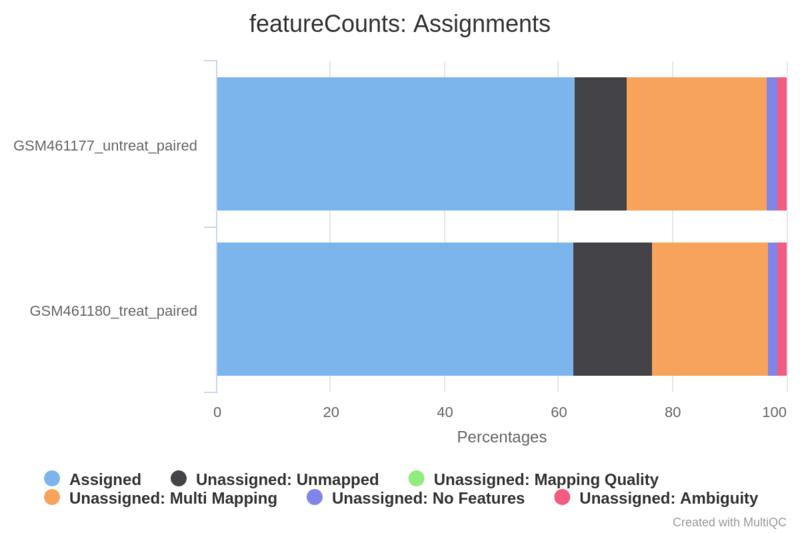 To display the most abundantly detected feature, we need to sort the table of counts. This can be done using the Sort tool tool, by sorting the table on the second column in descending order. This reveals that FBgn0000556 is the feature with the most counts (around 128,741 in GSM461177 and 127,416 in GSM461180). Comparing output is easier if we can view more than one dataset simultaneously. The Scratchbook allows us to build up a collection of datasets that will be shown on the screen together. In the previous section, we counted reads mapped to genes for two samples. To be able to identify differential gene expression induced by PS depletion, all datasets (3 treated and 4 untreated) must be analyzed following the same procedure. This is really interesting to redo on the other datasets, especially to check how parameters differ given the different type of data (single-end versus paired-end). To save time, we have run the necessary steps for you and generated 7 count files, available on Zenodo. This expression analysis is estimated from read counts and attempts are made to correct for variability in measurements using replicates, that are absolutely essential for accurate results. For your own analysis, we advise you to use at least 3, but preferably 5 biological replicates per condition. It is possible to have different number of replicates per condition. Multiple factors with several levels can then be incorporated in the analysis. After normalization we can compare the response of the expression of any gene to the presence of different levels of a factor in a statistically reliable way. Here, treatment is the primary factor that we are interested in. The sequencing type is further information we know about the data that might affect the analysis. Multi-factor analysis allows us to assess the effect of the treatment, while taking the sequencing type into account too. Principal component plot of the samples (PCA) with the first two dimensions. It shows the samples in the 2D plane spanned by their first two principal components. Each replicate is plotted as an individual data point. This type of plot is useful for visualizing the overall effect of experimental covariates and batch effects. What is the first dimension (PC1) separating? And the second dimension (PC2)? What can we conclude about the DESeq design (factors, levels) we choose? How are the samples grouped? They are first grouped by the treatment (the first factor) and secondly by the library type (the second factor), as in the PCA plot. The log2 fold changes are based on the primary factor level 1 vs. factor level 2, hence the input order of factor levels is important. For example, for the factor ‘Treatment’, DESeq2 computes fold changes of ‘treated’ samples against ‘untreated’, i.e. the values correspond to up- or downregulation of genes in treated samples. For more complex setup, e.g. with many samples, it is possible to use a collection with tags to specify the factors and levels. Check our “Group tags for complex experimental designs” tutorial, explaining how to do that. Now we would like to extract the most differentially expressed genes due to the treatment, and then visualize them using an heatmap of the normalized counts and also the z-score for each sample. How many genes have a significant change in gene expression between these conditions? We get 1,091 genes (6.21%) with a significant change in gene expression between treated and untreated samples. The file with the independent filtered results can be used for further downstream analysis as it excludes genes with only few read counts as these genes will not be considered as significantly differentially expressed. How many genes have been conserved? 130, the 11.92% of the significantly differentially expressed genes. We now have a table with 130 lines corresponding to the most differentially expressed genes. And for each of the gene, we have its id, its mean normalized counts (averaged over all samples from both conditions), its and other information. We could plot the for the different genes, but here we would like to look at a heatmap of expression for these genes in the different samples. So we need to extract the normalized counts for these genes. We will join the normalized count table generated by DESeq with the table we just generated, to conserve only the lines corresponding to the most differentially expressed genes. This ensures that the table of most differentially expressed genes has a header line and can be used in the next step. The generated file has more columns than we need for the heatmap. In addition to the columns with mean normalized counts, there is the and other information. We need to remove the extra columns. We now have a table with 130 lines (the most differentially expressed genes) and the normalized counts for these genes in the 7 samples. Do you observe anything in the clustering of the samples and the genes? 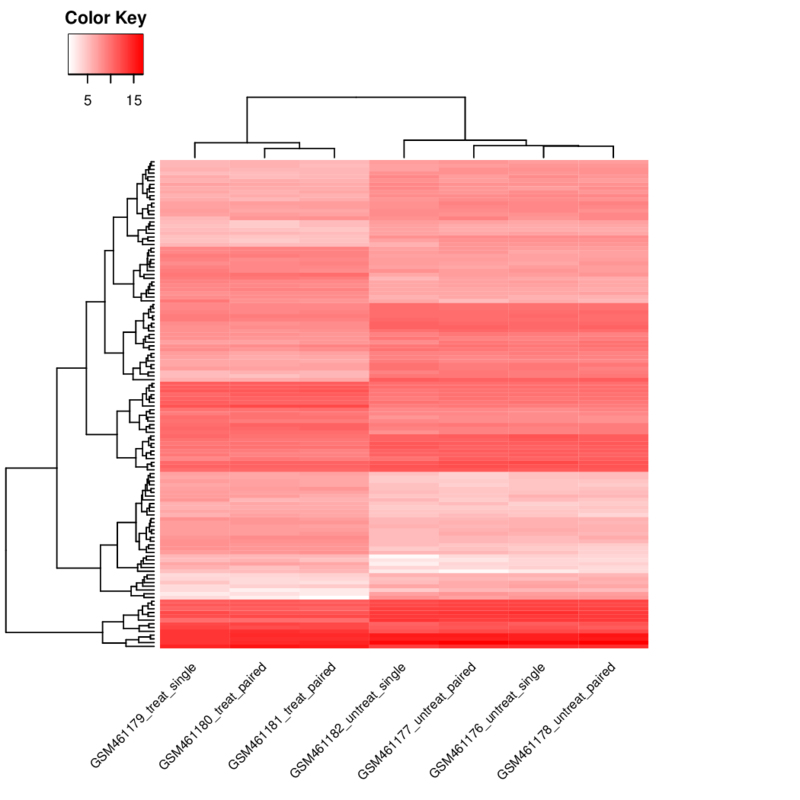 What changes if you regenerate the heatmap and select Plot the data as it is in “Advanced - log transformation”/“Data transformation”? 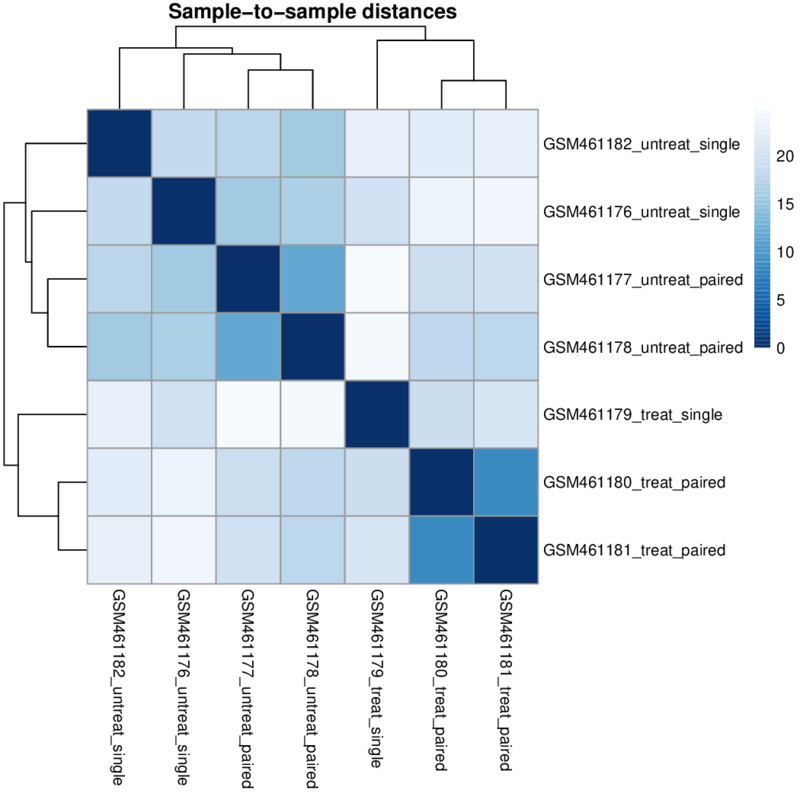 How could you generate a heatmap of normalized counts for all up-regulated genes with absolute fold change > 2? The samples are clustering by treatment. The scale changes and the differences between the genes are not visible anymore. 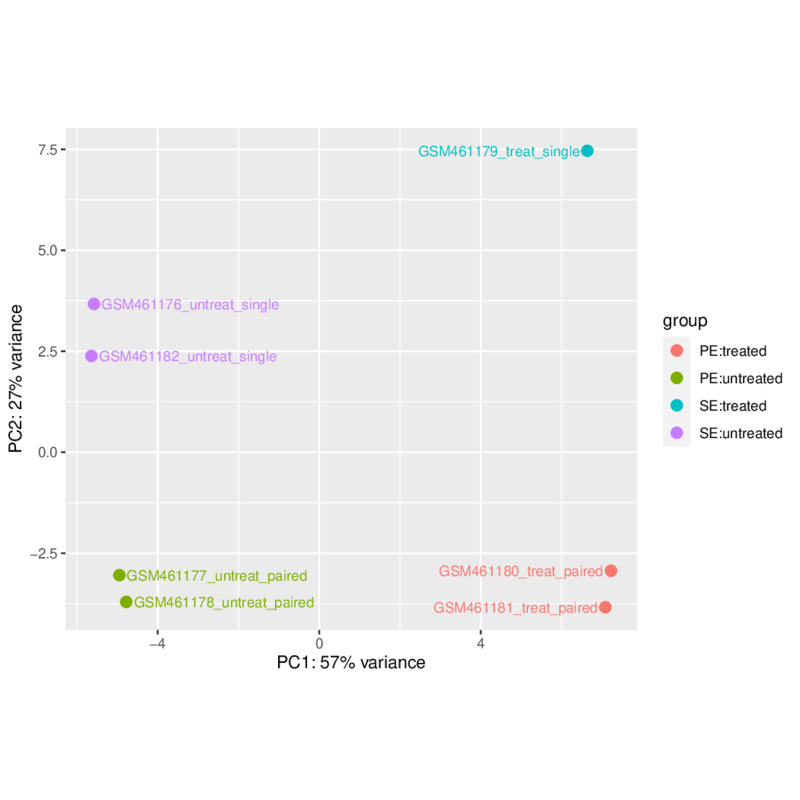 Extract the genes with ) > 1 (filter for genes with abs(c3)>1 on the summary of the differentially expressed genes) and run heatmap2 tool on the generated table. We have extracted genes that are differentially expressed in treated (PS gene-depleted) samples compared to untreated samples. We would like to know if there are categories of genes that are enriched among the differentially expressed genes. Gene Ontology (GO) analysis is widely used to reduce complexity and highlight biological processes in genome-wide expression studies. However, standard methods give biased results on RNA-seq data due to over-detection of differential expression for long and highly-expressed transcripts. The goseq tool provides methods for performing GO analysis of RNA-seq data, taking length bias into account. The methods and software used by goseq are equally applicable to other category based tests of RNA-seq data, such as KEGG pathway analysis. We just generated the first input for goseq. We need as second input for goseq, the gene lengths. We can use there the gene length generated by featureCounts tool and reformat it a bit. We have now the two required input files for goseq. To identify categories significantly enriched/unenriched below some p-value cutoff, it is necessary to use the adjusted p-value. How many GO terms are over-represented at adjusted P value < 0.05? Under-represented? How are the over-represented GO terms divided between MF, CC and BP? And for under-represented GO terms? This material is the result of a collaborative work. Thanks to the Galaxy Training Network and all the contributors ( Bérénice Batut, Mallory Freeberg, Mo Heydarian, Anika Erxleben, Pavankumar Videm, Clemens Blank, Maria Doyle, Nicola Soranzo, Peter van Heusden)!